Rich in butter, these tender and flaky pastries are a delicious treat! In a small saucepan melt margarine, set aside. In a large bowl, add milk and tap water (both at 110°-115°F). Add the vanilla, sugar, three eggs and Yeast. Whisk or beat with a wooden spoon until smooth. Beat in 4 cups of bread flour and the melted margarine. Gradually add the last 2 cups of bread flour. As the dough gets firmer, use your hands to work flour in. Place dough on a floured surface and dust any sticky parts with flour. Roll into a rectangle about ¼-inch thick. Slice butter in ¼-inch slices, place on centre third of dough about ⅓-inch from edge. Fold left hand side to center third, then right side over both, punch seams to seal. Roll again to a rectangle ¼-inch thick. If butter comes through just spread back in and dust with flour. Repeat the rolling and folding one more time. After the last fold, let the dough rest for 10 minutes. Roll dough into a rectangle shape again ¼-inch thick and brush with beaten egg. Starting at the long and furthest end from you, roll dough towards you jelly roll style. Cut into ½-inch thick pieces, flouring knife if it becomes sticky. Place on greased cookie sheets. Then place lightly greased canning rings around each butterhorn. Let rise uncovered until indentation remains after touching. Bake for 10 minutes in a preheated 400°F oven until golden brown. Mix the icing sugar and milk to a smooth paste. 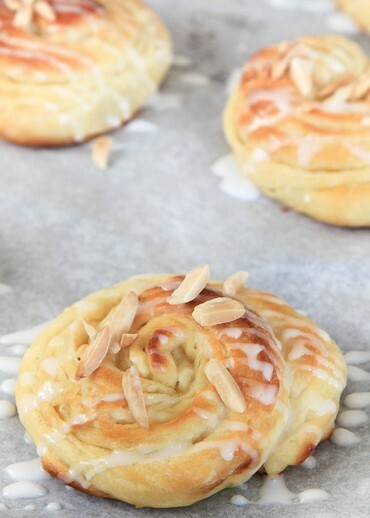 Drizzle over warm butterhorns and top with the walnuts or almonds. Recipe featured at Greens & Chocolate. These Butterhorns are fabulous! We sell out weekly at my Sister’ little cafe and have Customers that order a dozen at a time…delish! Can you make these with all purpose flour, or is there a way to make a substitute for the gluten additive? Yes, all-purpose flour can be used. You may need to adjust the amount of flour, mix times and rise times. Hi, I was told when I became aware of being gluten-intolerant that you should not try to substitute flours in a yeast recipe that was not made for gluten free flours because they usually all called for two rising times and gluten free flour types could not handle two risings. I have made a few that only called for one rising time and they did fine, but the recipe did not call for bread flour. You might want to put Gluten-free in the google search. I did find one recipe that was by “Mennonite Girls Can Cook” And I know there are others. They do not form the rolls as I know butterhorns are traditionally shaped, but I do not know why they would be able to be formed that way. Good Luck. Hi, just read your comment and these are definitely NOT Gluten free, in fact just the opposite, Bread flour has more gluten then all purpose does. could these be baked in a “Texas-sized” muffin tin instead of canning jar lids? You can certainly try that method. The bake time may need to be adjusted, and the butterhorns will take on the shape of the tin. Can you bake these without the rings? or will they spread to much? You can bake these without the rings. Let us know how they turn out! The recipe says “Let rise uncovered until indentation remains after touching.” About how long is that – minutes or hours? Many thanks! The rise time will vary depending on temperature and other factors, but should be about an hour. These were unbelievably delicious! Thanks so much. Do you remove the canning rings before baking? Bake the butterhorns in the rings. Remove the rings after baking once they are cool enough to handle.